OVER $200K in IMPROVEMENTS! Exceptional FORMER MODEL, SINGLE LEVEL home w/ 2 master suites in the upscale gated community of Las Piedras in Scottsdale. Located on a PREMIUM cul-de-sac lot & backing to the hillside/mountain preserve w/ organic desert mountain surroundings & BREATHTAKING VIEWS, this elegant home is ideal for full-time or winter residents. Owners have completed an extensive custom remodel and transformed this SINGLE LEVEL living space into a highly upgraded, well functioning OPEN FLOOR PLAN offering the perfect space for entertaining or just relaxing by the multiple gathering places. Welcoming gated front courtyard w/ fountain and private access to separate casita w/ ensuite. Dramatic entry sets the stage for well appointed interior finishes with artistic blends, including stone & wood floors, hand forged wood beams, redesigned stacked stone gas fireplace w/ built-in custom cabinetry surround & custom lighting. Fully remodeled gourmet kitchen with a brand new expanded center island, timeless granite slab, basket weave backsplash & custom cabinetry w/ rain glass, copper sinks, Viking appliances, wine fridge, 2 Viking ovens & 1 Dacor oven. DESIRABLE 2 MASTER SUITES enjoy walls of glass that capture the private hillside views w/ dramatic stone outcroppings, luxurious master bath w/ large granite slab counters, stone showers, dual sinks & walk-in closets. Separate den/4th BR w/ custom built-in bookcase & powder room w/ a one of a kind Jason Scott furniture piece for the sink. 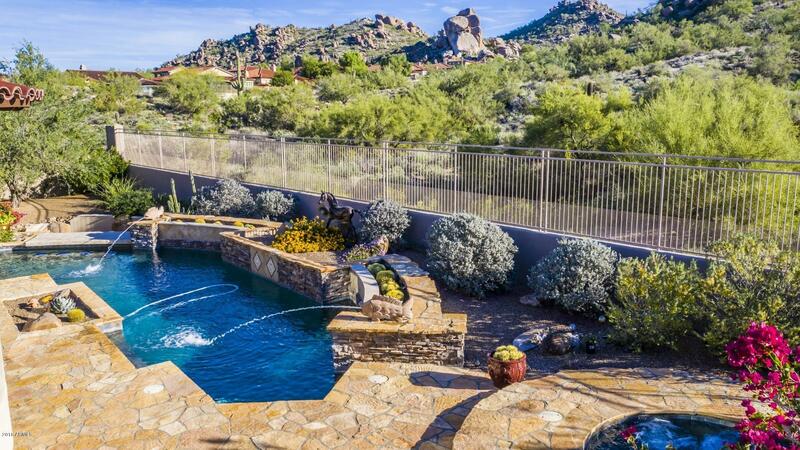 Private backyard oasis offers a fully redesigned custom heated pool w/ built-in swim up bar, stacked stone & water features, spa, diagonal tile & flagstone, outdoor built-in BBQ, private side courtyard, lush landscaping and tons of privacy. 3-car garage (1 extended & overheight). Las Piedras is a gated community of 64 luxury single-family homes offering a heated community pool & fitness center. Close to both world-class dining & shopping of North Scottsdale, Westworld, Carefree, hiking, golfing & the beauty of the high Sonoran Desert. A MUST SEE!